A musical evening full of highlights from opera and operetta with the singers Manuela Strack and Katharina Nieß, accompanied by the concert pianist Lukas Ziesché. 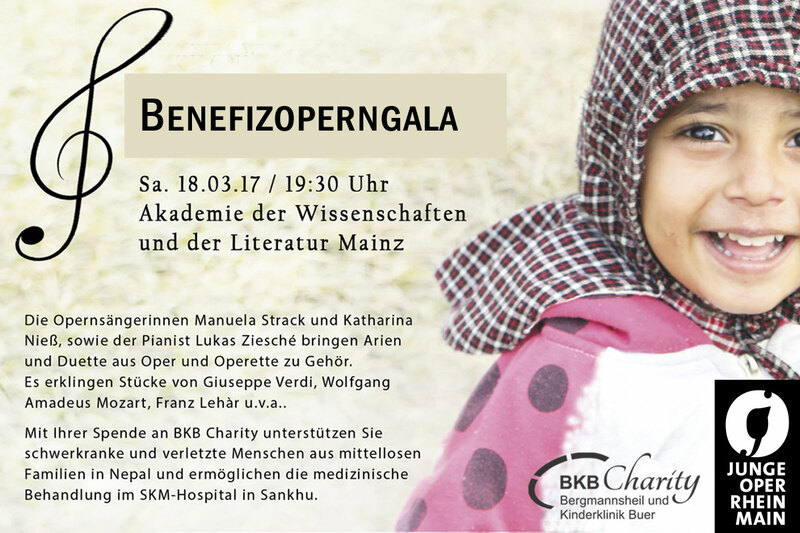 The Junge Oper Rhein-Main is organising a charity concert for the benefit of SKM Hospital in Sanklu, Nepal. The region, which was affected worst by the major earthquakes in 2015, still suffers from the devastating consequences of the natural disaster. The SKM Hospital helps the poorest of the poor, especially the needy children, for example through free surgical treatment of complicated bone fractures, burns or congenital malformations. The members of the ensemble and opera singers of Junge Oper Rhein-Main Katharina Nieß and Manuela Strack will present songs as well as arias and duets from opera and operetta. They will be supported on the piano by the choir director and concert pianist of Junge Oper Rhein-Main, Lukas Zisché. The concert will feature pieces by Guiseppe Verdi, Wolfgang Amadeus Mozart, Franz Lehàr, Johann Strauß, and many others, as well as songs by Johannes Brahms, Robert Schumann, and others. The entrance to the Opera Gala is free of charge. The donation following the concert will specifically provide funding for urgently needed hospital equipment. In addition, the money will benefit the treatment of traumatised people suffering from the effects of serious injuries in Nepal, a country which was again and again severely struck by the fate, and being one of the poorest nations in the world.